Driving through Angels Camp on my way home from my parent’s cabin in Arnold, CA, I spotted this remnant from the Gold Rush era just off of the side of the road. I pulled over, turned the kids loose on the playground and walked up to see what it was all about. This was the site of the Utica Mine in Angels Camp, a town made famous by Mark Twain in the The Celebrated Jumping Frog of Calaveras County. 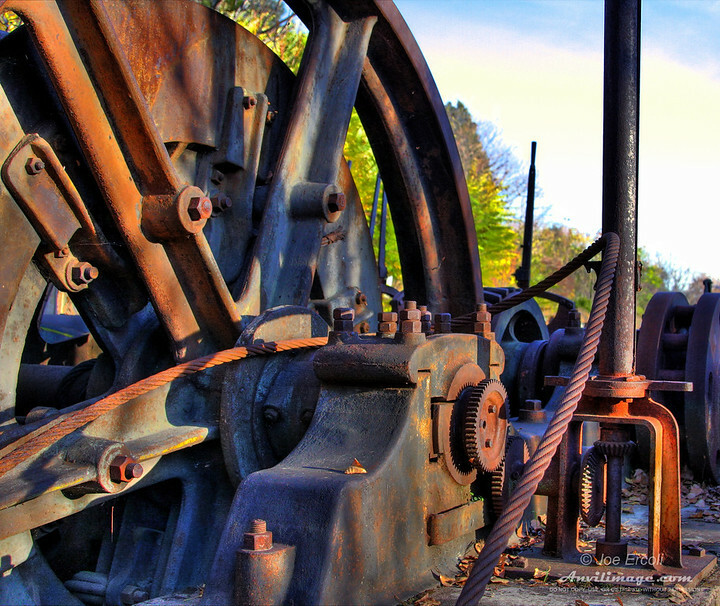 Except for a large plaque next to this decaying machinery, the Utica Park seemingly does little to celebrate the mines influence over the region. HDR Info: 3 Tifs derived from a single RAW and combined in Photomatix. Spot corrected with Photoshop by layered exposure blending. Shot hand-held. This entry was posted on Wednesday, December 10th, 2008 at 2:39 am	and is filed under Blog, Photos and tagged with angels camp, metal, mining equipment, rust, sonora, stanislaus. You can follow any responses to this entry through the RSS 2.0 feed.